Unsere Reisegesellschaft von 22 Teilnehmern aus ganz Deutschland startete am 19. April von Hamburg/Lüneburg in aller Frühe zu einer wunderbaren Reise nach Mitteldeutschland. Auf der Fahrt machten wir zunächst Station in Magdeburg, wo wir an einer angemeldeten Domführung teilnehmen konnten. Nach diesem gelungenen Auftakt fuhren wir weiter in die Lutherstadt Wittenberg, wo uns Herr Dr. Martin Treu in Empfang nahm und schon einen ersten Stadtspaziergang mit uns machte. Dr. Treu ist Theologe und Historiker und erwies sich als ein herausragender Kenner Luthers und seiner Zeit. Der folgende Tag führte uns in das Luthermuseum, für Dr. Treu ein Heimspiel, da er seinerzeit verantwortlich war für die Einrichtung dieser überwältigenden Luther-Ausstellung. Auch im Melanchthon-Haus, das sich mit einem modernen Neubau und einer entsprechenden Ausstellung präsentierte, erwies sich Dr. Treu als souveräner Führer. Es folgten die Stadtkirche St. Marien und die Cranach-Höfe. Der nächste Tag führte uns nach Torgau zur Katharina-Luther-Stube, einer liebevoll eingerichteten kleinen Gedenkstätte für Luthers Frau, die in Torgau starb, und zum Schloss Hartenfels, einem prächtigen Renaissance-Bau. 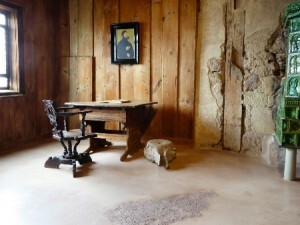 Hier entstand der erste protestantische Kirchenbau in Gestalt der Schlosskapelle, in der Luther oft als Prediger wirkte. Anschließend dann die Stadtkirche St. Marien, eine wunderbare, lichte Hallenkirche mit der Grabstätte Katharina Luthers. 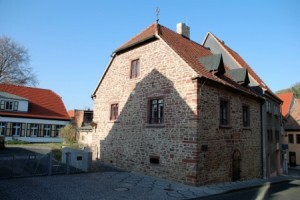 Weiter ging es nach Mansfeld zu Luthers Elternhaus und dem angeschlossenen avantgardistisch anmutenden Museum, das archäologische Funde aus Luthers Zeit präsentierte. Von Mansfeld fuhren wir nach Eisleben, dem Geburts- und Sterbeort Luthers mit entsprechenden Gedenkstätten und wieder überraschend interessanten Kirchen. 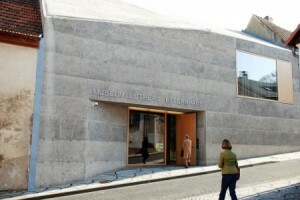 Luthers Taufkirche St. Petri und Pauli erwies sich in ihrer gelungenen modernen Restaurierung als besonders anregend, da die Pfarrerin über die jetzige Situation der Kirche im allgemeinen und über die Taufe im speziellen mit uns eine Diskussion führte, die viele Fragen aufwarf. Wir bekamen doch einen sehr guten Eindruck über die nicht einfache Lage hinsichtlich der Vermittlung des christlichen Glaubens – und das im Kernland der Reformation. Aber wir alle waren sehr berührt von der Persönlichkeit dieser engagierten Pfarrerin. An den beiden letzten Tagen besichtigten wir Erfurt mit dem ehemaligen Augustiner-Eremiten Kloster, sowie das beeindruckende Ensemble von Dom und Severikirche. Es folgte Eisenach mit einer lebendigen Stadtführung. 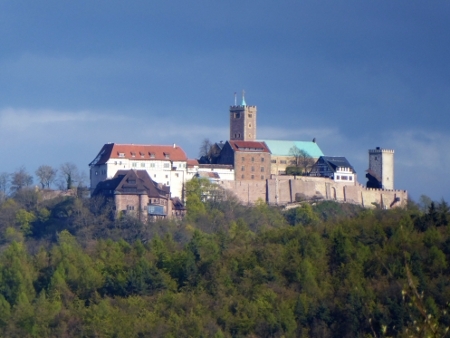 Den Schlusspunkt bildete die Wartburg, wo wir über den Sängerkrieg, die Hl. Elisabeth und natürlich über Luther als Junker Jörg informiert wurden. Zum Abschluss fand im noblen Restaurant der Wartburg ein festliches Mittagessen mit Dankesreden statt. Wir waren alle in gehobener Stimmung. Ein besonderer Dank geht auch an Frau Kern, die mit einer fabelhaften Organisation diese Reise ermöglicht hat. Es war wirklich eine Super-Idee, diese Reise vor dem großen Jubiläumsjahr durchgeführt zu haben. Ich denke, alle Teilnehmer sind bereichert und beglückt zurückgekehrt und werden sicher noch oft in Gedanken auf Martins Luthers Spuren wandeln. As a Frenchman educated in the Catholic tradition, Lutheranism is an unknown world. Of course we all know what Protestantism is about, but getting intimate with Martin Luther’s life, his work, his beliefs, his wife, his friends, his protectors, his powerful enemies and the places where he was born, where he went to school, where he became a monk and finally where he wrote his famous 95 thesis was an occasion that my curiosity could not miss. Mrs. Agata Kern (Kulturreferentin of the Ostpreussisches Landesmuseum) had the excellent idea of organizing a study trip through the various places where Martin Luther and his wife Katharina lived and died. We could not visit all those places without being accompanied by a person of great knowledge who could give us all the details which are not usually known to the layman. Doctor Martin Treu has just published a book called ‘Am Anfang war das Wort’ – (In the beginning was the Word) which covers Luther’s life and the Reformation movement in Europe. His encyclopedic knowledge of everything which concerns Martin Luther was impressive and no part of Luther’s life details was left uncovered. 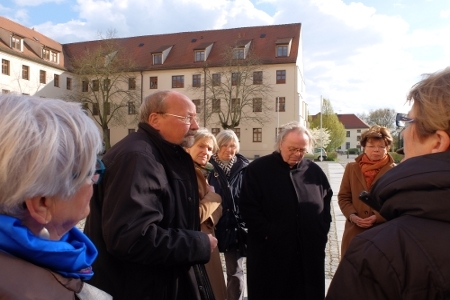 We started our journey in Wittenberg or more precisely Lutherstadt-Wittenberg where we visited his house, his best friend Philip Melanchton’s house and Lucas Cranach’s workshop. We went then to Torgau, visiting the Hartenfels Castle and the house where Katharina Luther died in 1552. In Mansfeld has been built a little museum opposite his parents’ house that we visited as well. Next step was Lutherstadt-Eisleben where he was born in 1483 and died in the same town in 1546: the two houses are a few hundred meters apart. In the church St Petri/Pauli where he was baptized, we had a very interesting session of questions and answers with Mrs. Simone Carstens-Kant, the local minister. We had so many questions, and Mrs. Carstens-Kant was so willing to answer and explain the situation of Christianism and religion in this part of Germany which despite so many souvenirs of Martin Luther, is in majority atheist. She was very enthusiastic about her mission, not discouraged by the difficult conditions of her ministry. In Erfurt, we visited the Augustinerkloster where Martin Luther was a monk starting in 1505 and was ordained there in 1507. Our final stopping place was Eisenach from where we visited the Wartburg castle where Martin Luther was kept hidden for almost a year. In the many churches we visited, with the exception of St Petri/Pauli which has been entirely restored in a modern fashion, what was striking is the fact that it was impossible to distinguish between the Catholic churches they once had been and the Lutheran churches they are today. What was just missing for a Catholic was the holy water basin at the entrance and the red light near the altar which signals the presence of the Holy Sacrament in the tabernacle. Nothing has really been changed: the same altar, the same statues, all the signs which identify a church of the period before the Reformation. There are discussions about what triggered Martin Luther’s decision to criticize the way the Roman Church was run at that period. Some suggest that this may stem from his trip to Rome in 1510/1511 where he could see the munificence way that bishops, cardinals and priests really live a life far from charity and prayer. His main criticism concerned the sale of indulgences. Indulgences were an easy way to erase committed sins without needing any repentance or confession: you paid and you were forgiven. In addition indulgences could reduce the time the sinner would spend in purgatory. That was the substance of the 95 thesis he posted on the door of the Wittenberg church in 1517. Later on he also criticized the celibacy imposed on priests although this was never required in the New Testament. He opposed the fact that very young people were sent to convents for their entire life without even been asked if they liked it or not. This produced the effect that a group of young nuns escaped from their convent and joined Luther’s disciples. He finally married one of them, Katharina von Bora, in 1525; she was sixteen years younger than he. They had six children and only four survived. All those criticisms generated the ire of the Pope and the Roman Church. Luther was asked to retract every criticism he had expressed publicly. Supported by more and more people and princes, he refused to change one word of his teaching. He was finally excommunicated in 1521. Skirmishes between Luther and the Vatican lasted a number of years. Eventually Protestantism spread; the very first country adopting the Lutheran faith as state religion was Brandenburg-Preussen. Whilst being protected from the action of the Church in the Wartburg, he translated the New Testament from Greek into the German language. This was a necessary step to apply his vision of the Christian religion: each Christian should be able to read the Holy Scriptures and understand them as he sees fit. Christians should no more be told by a priest what to believe and what not. He also declared that a pope was not necessary. Translating the New Testament within an extraordinary short time was not only an outstanding performance, but as well an important contribution to German literature. Indeed, Luther’s achievement is still accounted today as the first major piece of literature written in the German language. As Luther put it: “Reading from the lips of common people….” He followed his intuition and thus put the Bible’s message in common language to be understood by everyone. The dark side of this great man’s intellectual and religious contribution to mankind and History was the fact that towards the end of his life he became more and more aggressive against the Jews who refused to convert. Martin Luther considered their refusal as a personal failure. Georg did a wonderful job in driving us safely through Martin Luther’s home country and doing this always smiling and having a nice word. I also want to thank the group for offering the Barbarians (Gudrun and I) – in the Roman sense of course – a warm welcome. Indeed we enjoyed every minute of this excellent trip. Last but not least I want to praise the way Mrs Agata Kern organised everything, having a nice word for everyone and showing an equal mood even when things could be a little difficult. Sie sind momentan im Blogarchiv für Juli 2016 von Ostpreussisches Landesmuseum.